Do you offer both Daycare and Boarding? Yes, we offer both services. 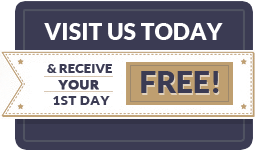 Feel free to bring your dog by to spend the day, or part of the day, while you are at work, on a day trip or shopping etc…We have rates for full day, half day, or even just a few hours; so feel free to come by for as long as you need. We also offer cage-free overnight boarding, so if you head off on vacation, a business trip or just need a night to yourself, we’ve got you covered. Will my dog always be supervised while at The Hounds Club? Even overnight? Yes, constant supervision is a key factor in making sure that all of our dogs have the very best dog daycare boarding experience possible. The safety and security of your dog is our number one priority, so will always be a staff member in the room with the dogs during daycare, as well as an employee sleeping the Bunk Room with the dogs overnight, most likely sharing the bed with several canine buddies. Do you require reservations for Daycare or Boarding? We require reservations for boarding, and also require a separate evaluation day of daycare before your dog can be eligible for overnight boarding. We do not require reservations for daycare, so you can feel free to stop in at any time, though we strongly suggest that you call ahead during typically busy holiday weeks, and daycare will not be offered on holidays. What happens if I book a night of boarding and have to cancel or don’t show up? We ask that you make any changes or cancellations at least 24 hours in advance so that we can make arrangements for sufficient overnight staff. When you book your reservation, we will take a deposit equal to a one nights stay to cover no shows, but will credit that night towards your stay if you arrive as scheduled. For holiday weeks, the deposit will be equal to two nights at the holiday rate. Do you offer discounts if I have two or more dogs? Yes, we offer a 30% discount for any additional dogs for both daycare and boarding. 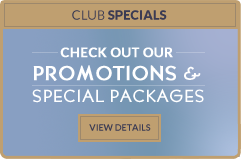 View additional Special Offers. We believe almost any dog would benefit from daycare. Daycare is a safe and healthy environment for socialization, giving your dog a chance to run, play, and make new friends while you are off at work. 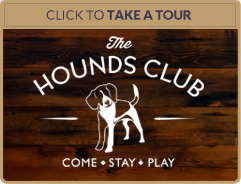 Even if you are home during the day, unless you spend your whole day at the park, you would be hard pressed to provide the same level of activity and socialization that your dog would receive at the Hounds Club. When you pick your dog up from daycare, he will be tired, content, and ready to relax with you after a full day of play. What if my dog doesn’t get along well with other dogs? Unfortunately, The Hounds Club is not suitable for dogs that require their own space or that don’t interact with other dogs well. If you’re unsure as to whether or not your dog is able to socialize comfortably with others, you can always fill out an admissions application and bring your dog to The Hounds Club for a free no-obligation temperament and socialization evaluation. Are there any breed restrictions at The Hounds Club? No, we carefully evaluate each individual dog during our admissions evaluation process and are confident that dogs that pass the audition will be friendly, social members of the pack, no matter the breed. On the flip side, any dogs that demonstrate aggressive behavior will not be allowed to remain members of the Club, again independent of breed. Do all sizes of dogs play together in daycare? No. To make sure each dog feels safe and secure, the play area is divided into three separate sections for small, medium and large dogs. Each group has their own cage-free environment with plenty of room to run, jump and play the day away. Can I bring my dogs favorite toys and chews? No. Even the friendliest, most social dog can become possessive if another dog runs off with a favorite toy or treat. The Club will have plenty of play equipment and toys to keep your dog busy that will not create friction between dogs. Will my dog sleep in a kennel at night? No. We don’t use kennels, crates, cages or “suites” for daycare or for overnight boarding. The only time we use crates is to separate dogs during feeding time. We have a very nicely appointed Bunk Room, set up with cozy, custom made bunk beds, so the dogs can sleep “slumber party style” with many of the same friends they spent the day with. They will also share the room with one of their human friends, as one of our staff will spend the night in the bunk room as well, usually piled high with snuggling dogs. If your dog does prefer to sleep alone in his or her own crate, feel free to bring your own crate with you when you check in, and we will be happy to accommodate. There are no designated nap times because most dogs will take a break when they need it, and we have plenty of dog cots throughout the play areas for rest time. However, if you would like your dog to be separated for any part of the day, please let us know and we will try to accommodate you. Where will the dogs be fed? Dogs may love playing with other dogs, but they often don’t like sharing their food. For that reason, we have a dedicated room with crates that allow every dog to be fed separately. Is there an additional charge for feeding my dog? Morning and evening meals of owner provided food are served at no charge as a part of the boarding service. We ask that you please portion out your dogs food in individual locking plastic bags for each meal within the boarding period. If you have no food, or it runs out during your dogs stay, we will be happy to provide a quality kibble for a $2 fee per meal. Because it requires us to divide staff during the day, we also charge a $2 fee for lunchtime meal service unless your dog is under 1 year old or is under special veterinary instructions. What about dogs on special diets or dogs that require medication? No problem. We’re experienced at working with dogs that have special dietary needs as well as dogs requiring daily medical attention. We ask that you please give us very explicit written instructions so that we can care for your dog as well as you do. We require that all dogs be up to date on their vaccines rabies, distemper combo & bordetella. Please bring, or have your vet fax over, your dog’s records before the first stay and whenever updates are required. We also require that your dog be on a flea and tick medication at all times of the year. In order to prevent the spread of any parasites, if fleas or ticks are present on your pet, we will bath your dog with a flea and tick shampoo at your expense. Yes. Most dog bites involve dogs that have not been fixed, and unaltered dogs are also associated with excessive barking, mounting and dominance related behaviors. For the safety of your dog and all other members, as well as the relaxed social atmosphere of the play areas, we must insist that all dogs over 6 months of age be spayed or neutered. In an emergency, we would attempt to contact you or your emergency contact immediately, but would take your dog to the nearest veterinarian to seek urgent treatment as required. For more minor injuries, we will attempt to remedy the situation, and if veterinary care might be required we will ask you how you would like us to proceed.